The versatility of the Cleo II treatment centres facilitates multiple working methods and a variety of dental procedures. Advanced operator's and assistant's consoles ensure that Cleo II will serve as the 'complete surgery system'. The unit is now supplied with 820S unit mounted operating light with on/off touchless sensor. Preset micromotor and torque control with auto reverse and LED display. 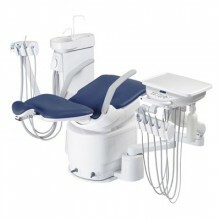 Click the button below to add the Belmont Cleo II (E) Surgery System - Electric Version With Light - Dental Chair Package to your wish list. All prices are in USD. Copyright 2019 Tools 4 Docs.